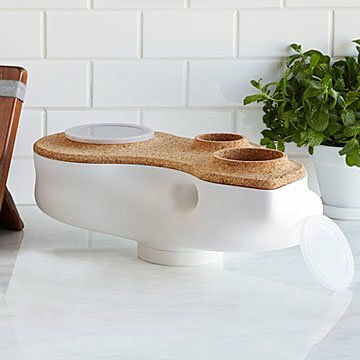 Designed scientifically, this odorless, biomorphic composter turns food scraps into fab fertilizer. The happiest, healthiest plants ever—that'll be the end result of feeding food scraps to the worms in this sculptural compost container. Most worm farms look, if we're being polite, "functional." And most compost containers, in tactful terms, do not smell like roses. This one, cool-looking and odorless, raises the bar on both counts. The designers of this biomorphic worm house collected data for almost two years, then created an algorithm to figure out the best shape for both worm health and human convenience. Drop fruit and vegetable peelings, grain foods, and tea bags into a top opening. The worms-in-residence will eat at least half of their own weight of scraps per day. The composter can "process" over two pounds of food a week, enough to keep up with most or all of the scraps in a two- or three-person household. Spread the easily removed compost next to your plants or in pots, and watch those babies grow. Worm "castings" (a fancy word for the worm equivalent of manure) are the best natural fertilizer there is. They're packed with water-soluble plant nutrients, beneficial enzymes and microbes, and improves soil's ability to hold moisture. So potent is vermicompost that as little as a tablespoon could feed a 6" potted plant for over two months. Worms not included. Made in Taiwan. Click here to see how the composter works in four simple steps. Wondering what to put in your new composter? Click here to see a full list & composter instructions. Not Included: sawdust soil mix and worms (500 grams). Cork lid may warp with humidity and fluctuations in temperature, to rectify this, firmly bend the lid back into shape. This is a great small composter. Beautifully made and easy to use. Love it! The lid was a bit tight in the begining, but it fit well afterwards. Already adding worms and the compost is starting to look good! Not cheap but worth it, would definitely recommended! I use this composter in my small apartment. It's the perfect size, no odor, very easy to set up and use, and requires next to no maintenance. Simply add worms, dirt, and food waste and it takes care of itself. Its beautiful look fits my kitchen. My kid checks the composter like crazy, and sometimes the seeds from our food waste germinate. Even that it's a bit small for us, it still helps me deal with my everyday food waste and fertilize my plants!